However, I've liked the design well enough to have speculated the time to finish off the construction detailing. The photo shows one built by Larry Sweet as a tender for his Cascade Classic 39 pilothouse cutter of our design. She was done with foam cored 'glass construction as is his 39. 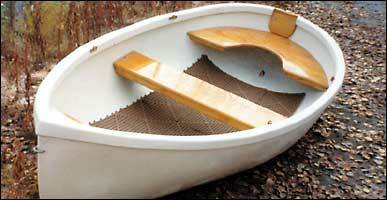 The construction called for is cold-molding, which produces a light and strong boat. This is probably the best choice for a one-off, if the builder is not experienced in other techniques. She could also be done in lapstrake, by the stripper method or in foam-cored fiberglass. The daggerboard slot comes down alongside the centerline skeg, so this will not have to be weakened with a cut through it. A tee shaped slot cap should be made for use when the boat it being towed or under outboard power. This will keep water from splashing through and eventually flooding the boat. If she is to be towed, the towing eye should be fitted about three inches above the datum waterline (noted as DWL on the drawings). This will help hold her head up making towing easier. Be sure to through-bolt the towing eye to a backing plate for maximum strength. Estimated structural weight 90 lbs. 41 kg. Displacement, to DWL 270 lbs. 123 kg. Note: The displacement numbers are calculated to the arbitrarily chosen DWL. The calculated ratios of displacement-length and sail area-displacement will vary widely depending on the loading of the vessel.